Where I get to write at random on any topic I so choose and you get to read it! I was born in Milton, Florida August 22, 1985 after Jack in November 3, 1983. Since then I have lived in several places in Georgia mainly on the Northeast side. I am the second oldest of nine children to Rocky and Debbie Howland. Gabe was born 1987, Sarah 1990, Michael 1993, Laura 1995, Hannah 1996, Marjory 1998, and Alaina 2003. On May 12, 2007 I was married to Nathan, the love of my life. We have two cats and want a third one day. For now we are blessed and are enjoying life where we are. LEAD ME TO THE CROSS...TO YOUR HEART.. Recently, my husband and I caught a nasty cough. I often find myself wanting to sleep it off, but with a stuffy nose, achy body, and needy cats, it is hard to do so. With my husband being sick, we both end up going stir crazy. With our favorite author Brandon Sanderson's new release on Tuesday, we ended up reading "Words of Radiance," aloud together. While I would have liked to sleep instead of read, I couldn't resist this novel. We have been waiting for this one for three years now. We had recently re-read "The Way of Kings" the first in the series. So naturally, the sequel and our great anticipation of it could not wait another week! So between sniffles, blowing noses, coughing, and sneezing we have managed to read to page 368 (out of the 1088 pages!) and Nathan went to work this morning! What am I going to do? "Catching Fire" was released today on Blu-ray and we plan on watching it with his family, but why would we want to watch that with the book waiting for us?! Here is what I have been doing. . .
Reading Winnie-The-Pooh is always a comfort with a nice cup of tea, while I wait for my husband to get home to read Sanderson's sequel. My chair is looking comfy with my afghan project, huggy pillow, books (you can see the massive Sanderson Sequel below "Pooh"), water bottle, tea, tissue galore, basket for tissue landing, and heater. I am in need of a proper end table and have been feeling guilty about using my piano bench. I have been careful about using coasters, however. 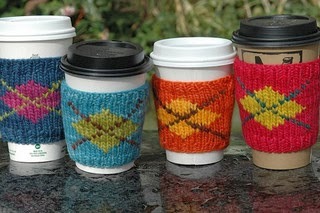 In the meantime, this is what I want to be knitting! I have never been much of a Christmas decorator. I usually just wanted to own ornaments and wrapping paper, nothing more. This year, I have really been getting into the Christmas spirit. I don't have a lot of money to spend on nice Christmas decor, but I ran across an idea on Pinterest where you can make a wreath out of fabric and a coat hanger. So here is my instructional. 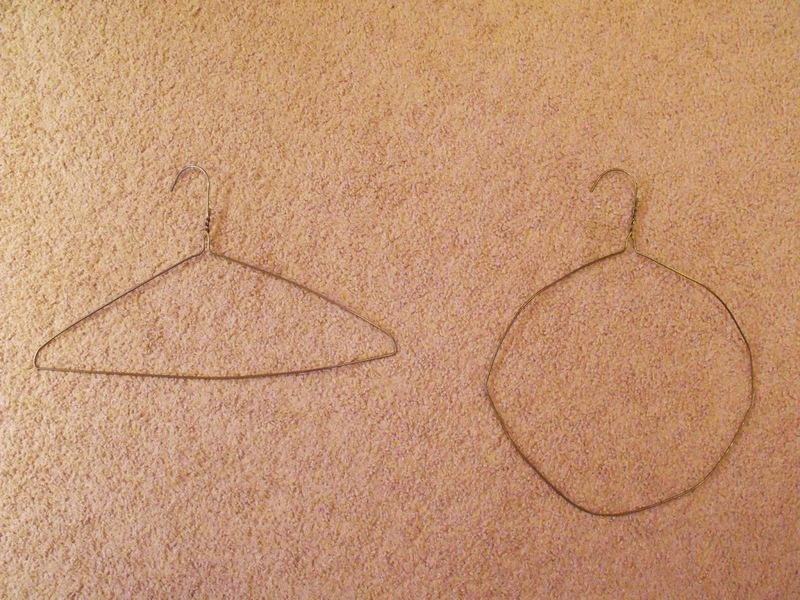 First, take your coat hanger and work it into a circle. You can see that mine is a little lopsided. 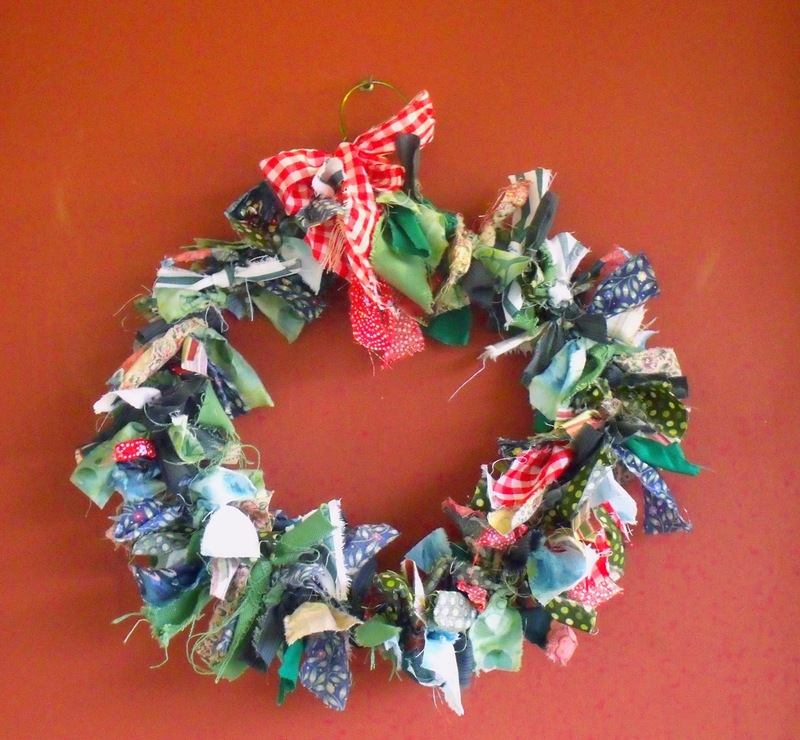 This doesn't really matter, because you are going to tie fabric strips to it, leaving the brain to think that it is a circular wreath. 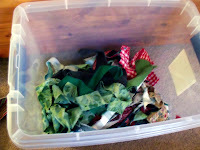 Second, decide whether you want reds or greens and then snip and strip the fabric into several two inch wide strips. This is just to make it even more no-fuss, you can rotary cut the pieces if you want. I didn't even bother with ironing out the wrinkles. Maybe I am just lazy. Meh, whatever. 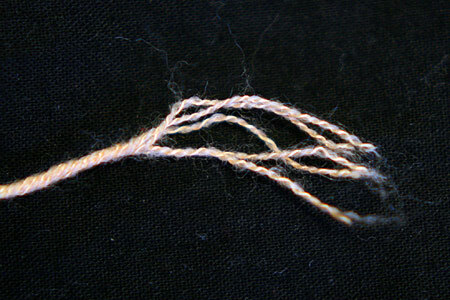 Third, take your long strips and cut them into smaller strips about five to six inch long. 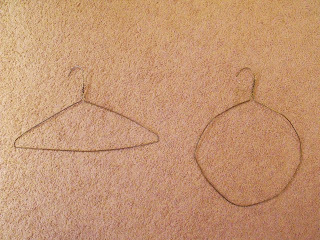 Grab them up at random and tie them onto your coat hanger. I put a little bit of red on my wreath, but it was just to add festiveness to it. Next, hang it on your door, over your fireplace, above your favorite couch, or wherever it most suits you! I loved the way my green wreath looks on my red front door. Bonus: with the leftover fabrics, you can put them in a mason jar, tie a red ribbon around the jar and you get a second Christmas decoration to place anywhere you please! 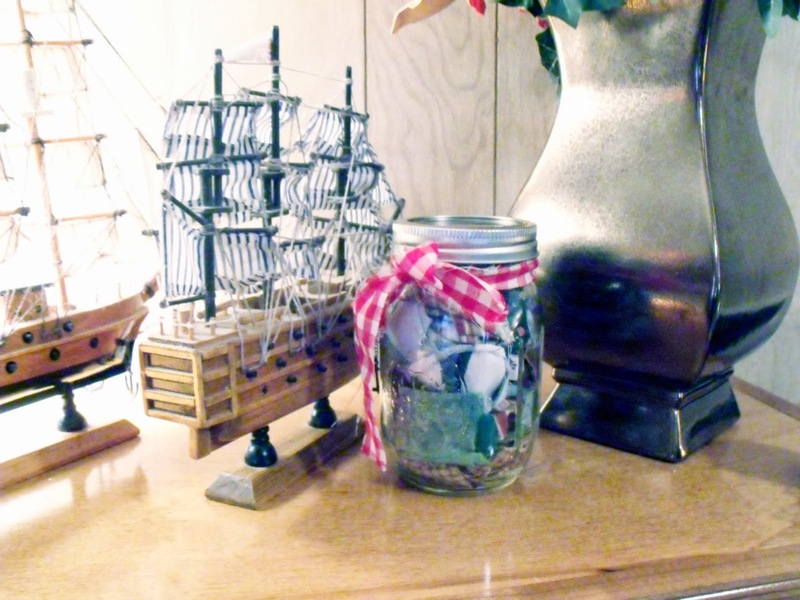 I can't decide if mine belongs on a shelf with my husband's model ships or beside the lamp on my DVD/Bluray shelf. A co-worker of mine asked me a simple question that got me to thinking, "Are you going to bake it or fry it?" This was a question about not just any food, but the all time favorite American staple: bacon! "We are talking about the same type of bacon right? The one that comes from pigs?" She wasn't lying. "Sure! Just pop it into the oven at 400*F for about ten to twenty minutes. Line a baking sheet with aluminum foil, place a cooling rack on it and place your bacon on the cooling rack." Now why didn't I think of that before? No flipping the bacon either! And if you spray the cooling rack before putting the bacon on it, it will slide off easy when finished baking. Now who is up for baked bacon? I've tried and tested this two times now with success on both occasions. And here is a shot of Nathan's cat wanting attention. It was the only empty chair in the kitchen. As you can see, Nathan was reaching over to get a piece of bacon off my plate while I snapped this one. And your husband does not cook and you know you would rather eat soup all week than something that comes out of a fast food restaurant when your leftovers are all gone. This morning I slept in (8:00). Nathan made me coffee and called the library to tell them I was in bed and very sick. What a sweetie. He told me he wanted to go to Fatz and buy me enough soup to last me a week. I had made him a huge stockpot full of soup two weeks ago when he was sick and miserable. He told me it had been a lifesaver for his poor and swollen throat. So now I am the one sick and I would rather not spend money on Fatz soup even though I know it would be a big help. This is my method of making soup while I am still miserable and it helps every now and then to get up out of the recliner; at least it reduces the amounts of aching I feel than when I am inactive for too long. First, start with a huge stockpot and fill it halfway with water. Get this pot ready to boil and in another smaller pot, boil your chicken. Go rest. Yes, that is right. It will take a while for both pots to boil, so take a timer and set it for 15 to 20 minutes and go rest! When it dings, go check the pots. For the chicken pot you will want to lower the temperature so that it does not boil over. 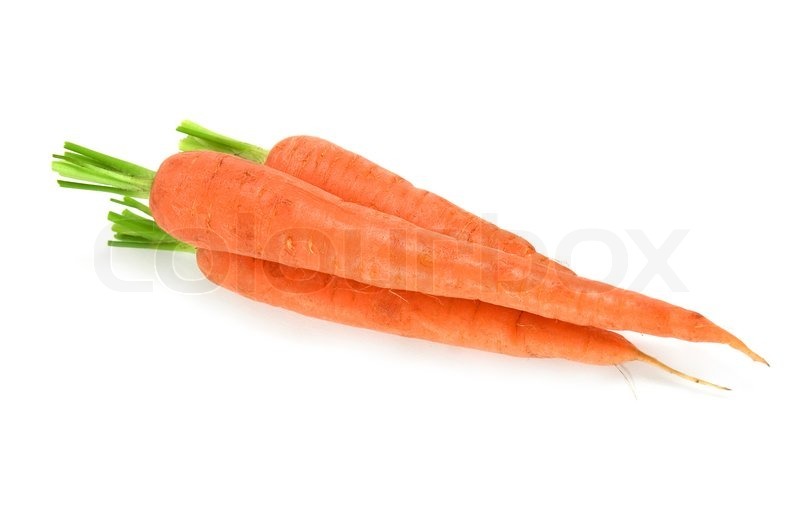 Second, while you are in the kitchen, cut up just two or three carrots, because you will not have the energy to do any more. Now go rest again for 20 minutes more. Third, when the timer is done, go chop some chicken. Chop some more chicken and a carrot if you are nearly done with the chicken. Hopefully the chicken will be so tender that you can just slice each piece against the grain in two or three slices each and then pull apart shreds with the grain. This is how I usually chop BL/SL chicken breasts and thighs anyway. When you have had all you can handle at this point, go rest some more. 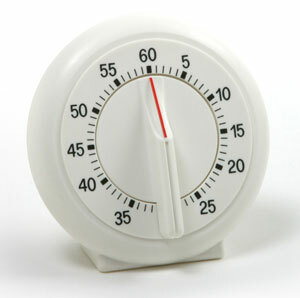 The timer is only to help you not fall asleep, creating a disaster in the kitchen (like having the pots boils down and then burn everything in the pot and ruin dinner). You are almost done! Chop the rest of the chicken, if there are any left, or the rest of the carrots, and pour in a package of noodles, the boxes of chicken broth, and bash two garlic cloves with the flat of your carrot chopping knife (I use a chef's knife). Just plop those cloves into the pot. You can extract them when you see them later or eat them whole because you know they are really good for the flu/cold. Last step, I promise! Stir in a splash of olive oil. It helps keep the bottom sinkers from sticking to the pot and burning. This seems to work well for my stainless steel pots. Now cover the pot, reduce to lowest heat setting, and go rest as long as you want. When you have finished eating your dinner portions, simply put the entire pot in your fridge (if it is a large enough fridge) and scoop out portions from this pot all week until you get the volume down to the size of your largest storage container. They Say That Dryers Eat Socks. What Eats Bookmarks? We are always concerned with socks and the missing pair being kidnapped or eaten by the household dryer. What about bookmarks? Since moving across town back in November, my shoebox of bookmarks was declared missing and instead of using a regular bookmark, I have had to resort to using random household objects among anything that is flat, small, and basically declared trash or useless. (it is a PCI slot cover which goes on a computer case and can be found randomly strewn in my husband's office). I put it to the test and now heartily disagree with him on that one. I found it heavy and bulky when reading a paperback or thin book. Oh, and I lost that one too! You may say to me, "But you work in a library where bookmarks basically grow off trees!!" Yeah, I know. That just shows how lame and pathetic I am. If I take one home, it will only survive a few minutes even if it comes home in a book. It is destined to go missing, just like all the others. 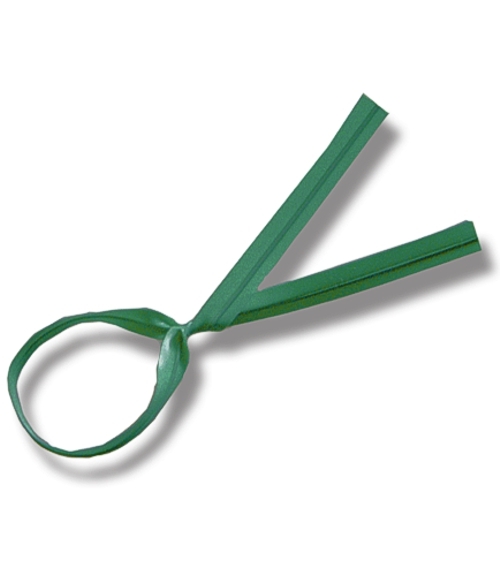 What is the most random household item you have used for a bookmark? Tonight, after getting home from Cashiers and feeling achy and tired and wanting to battle that tickling feeling in the back of my throat, I decided I could not give in! I wanted to get to work right away on a soup. It could be my last good meal of the week if I catch a cold. So I looked in the fridge, there was nothing, well almost nothing. I looked in the freezer, same. The pantry produced a few canned goods, but nothing to make a full and filling meal. I really needed to go to the grocery store. I did not want cereal for dinner; not this time. Plus milk and dairy products are not that good for mucous and colds. So I have read anyway. It was either going to be me going to the store or me putting on my thinking cap and putting effort into a decent meal from nearly nothing. I have done this many a night when we had to stretch our bills and make it just one or more days until payday. Tonight, it wasn't because of a lack of funds, it was a lack of strength to walk down those twenty-five stairs to the car, to the store, and back up the stairs with groceries. Nuh uh! Not tonight! I was going to make something and it was going to be great! I set about pulling out a nearly empty bag of carrots, three potatoes, fresh parsley that would not be fresh in a couple of days, half a shallot, two tablespoons of butter, two cloves of garlic, a can of tomatoes (which had habaneros in it and made me think about my tickled throat and a possible cure), a lone Kaiser roll, small chunk of Romano Cheese, and my pot, cheese grater, potato peeler, prep bowls, chef's knife, and my flimsy chopping matt. I was going to make a "nothing soup." I have had great success with them in the past. Making soup, and a lot of it, from almost nothing and the bottom of my fridge. All those things that may go bad soon get put into the pot and in a way that is necessary to make it taste good. I have stopped using dried herbs and spices a long time ago and use fresh herbs, fresh garlic, and onion for every dish. It is fun and makes me feel like a kitchen goddess, all powerful over the fresh foods and ingredients, and all knowing of how good the foods will taste when chopped with precision and blended how they should be. So I don't really know exactly how things will turn out, and tonight was just one of those nights I had no control over. Goddess-of-kitchen-bubble bursted. I melted butter in my pot and then added the minced garlic and shallot and sauteed them while hovering my face over the pot and taking deep breaths (you should try it! It relieves sinus pressure, tickled throat feeling, and opens the airway passages). I love garlic! So after sauteeing for about three minutes and breathing deeply and with great satisfaction I moved on to dumping in the chopped carrots, peeled and chopped potatoes, and chopped parsley. I rolled it around in the pot for two minutes before adding in the can of tomatoes and a water/chicken broth/chicken bouillon mixture. I did not forget to add salt to this pot, like I am very notorious for doing with most all of the times I had made "nothing soup." I figured it needed to boil until the potatoes and carrots were soft. Which was about twenty minutes. I decided to try a small sampling taste after I let it simmer for ten minutes. My lips tingled, my eyes watered, my nose ran, and my mouth said, "OOPS!" I should have used only half the can. Maybe adding some romano cheese and olive oil will help some. So I did. It smelled lovely and delectable and almost a masterpiece. I let it simmer some more and cut the roll in half and grated some of the cheese onto each half before placing it in the oven to broil. I had the table set and ready for dinner with another cringe and very little hope as to whether Nathan will like the flavors or not. I was confident of only one thing, Ok two. One, that it will be very spicy, and two, that the bread was going to be great dipped in the soup. Maybe I could manage...NOT to kill myself. I knew Nathan would survive. But would I? Nathan loved it and especially the Kaiser roll dipped in it, but I got that feeling like I wasn't going to survive one bowl! I was slurping one spoonful per six gulps of tea and a mouthful of bread all the while telling him, "it's too spicy, I can't believe I did that! My mouth, OH! My mouth! QUICK, more tea! HAND ME THAT CHAPSTICK!" After Nathan finished his second bowl, I decided to try eating big spoonfuls in quick succession and then eat bread and drink sweet tea after it was done. That theoretical plan did not go over well. That is when I really felt like I was going to die! And I did not get close to finishing one bowl. ALL of the leftovers are for Nathan's lunch tomorrow and for whomever wants to take a helping if he doesn't finish it. I have learned a great lesson! Romano-cheese-toasted Kaiser rolls are my new best friend and tomatoes with habaneros are NEVER a good idea for a soup for two! Tomorrow I am going grocery shopping! This calls for a remake and it will be in the crock pot with no peppers. Ok, maybe one very ripened and skinned jalapeno for flavor only, and maybe I will leave it whole so I can remove it and not eat it and I will write down my exact ingredients and amounts of each for future reference. Nathan can make his own pot the spicy way if he wants a replica! Rice and Chicken with a side of Green Beans! Tonight I made a very tender chicken breast with leeks simmered in white wine with my green beans (from the can and cooked with salt, pepper, olive oil, and a pinch of sugar!) and a very delicious and moist rice pilaf. This is the first time I have ever been able to get Nathan to eat a second helping of rice and want leftovers for lunch the next day! No joke! He only came in twice to see how long it was going to take (forget that it is called 30 Minute Meals 2! ), to which I told him, "not thirty minutes!" He left the room mumbling, "ok so forty-five" which still was not close to the real deal. It took an hour and twenty minutes, about forty-five minutes was spent on the prepping in my small kitchen. Did I mention I have a very small kitchen table, no island, and only one space between my stove and sink for prep? I had so much fun feeling all chef-like and getting out the prep bowls, karate chopping the chicken breasts, even though Rachael does not say to do this, to make them flatter and of course to make them tender. It works better that way! I do not own a meat tenderizer. And yes, my hands do get sore and sometimes bruise, but it is so much fun! So after pounding the living daylights out of the already dead chicken breasts, I sing and dance to music in my head (I should really invest in a docking station for my Zune player) while finally beginning on the three dishes. First the green beans, then to saute the shallot in olive oil for the rice and then simmer the chicken in the third pan. I cannot tell you how long it has been since I have had more than two dishes going at once. A LONG TIME! I am not usually proud of my cooking at all, but tonight I was proud! I got all three dishes finished at the same time! WAHOO! Ok enough celebrating. So I add the rice to the shallot and oil mixture and saute that while flipping the chicken. I add white wine to the rice and let it evaporate while I pull out the chicken and stir olive oil, pepper, salt, and a pinch of sugar into the bean pot. Once I got the leeks sauteing, I added chicken broth, water, and thyme to the rice, boiled it and then covered it and set the timer for twenty minutes. So that is the time Nathan comes in announcing I have been at this for an hour now and I wave him away and tell him it is almost done and that I would get him when it is. The chicken was added back to the pan with the leeks. "Nestle the chicken in with the leeks" Rachael tells me. I am pretty sure I did it a lot less gracefully than she described it. I dropped them in and jumped away to prevent burning. Then added white wine and simmered. My favorite part came next. When the timer rang, I added lemon zest from an entire lemon and chopped parsley to the rice. It was so fluffy, smelled like nothing I have had before, and not at all gummy or sticky! And I was using a Calphalon stainless steel pot! It did not stick to the pot. My favorite line from tonight was when I scolded Nathan (oh yes I did!) for ruining the chicken when I found him adding red pepper flakes on top as I turned to the stove to serve myself. "I am not ruining it, I am enhancing the flavor!" I did finally convince him to try the leeks and he did enjoy them. He also added red pepper flakes to his rice and tried adding them to my chicken as well, "you have to try it!" My mouth was on fire and I spat incoherent phrases (don't worry, no cursing ever comes from my tongue) and downed my entire glass of lemonade before everything returned to normal. He got food and entertainment. I was pleasantly surprised and cannot wait for next Wednesday! I will not know what recipe until the day I cook it. I pick it randomly and while sitting in the grocery store parking lot searching for pen, paper, and recipe at the same time. Until then, hope you enjoyed my adventure as much as I did.